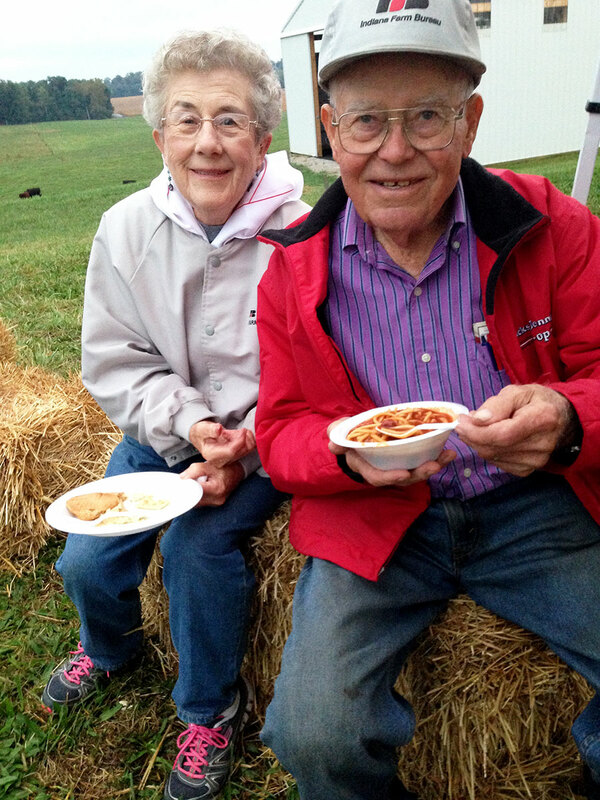 LANESVILLE—Thirty miniature hot air balloons brightened the overcast night sky in rural southern Indiana on Sept. 29—one for each year that Pete and Joan Schickel have hosted the New Albany Deanery’s fall youth Mass at their family farm. This year’s Mass was celebrated by Franciscan Father Robert St. Martin, pastor of St. Mary Parish in Lanesville, with the assistance of Deacon Rick Cooper, also of St. Mary Parish. Rain ended just as Mass began, allowing umbrellas and rain gear to be stowed. The fall youth Mass tradition started in 1983 when Father Joseph Sheets proposed the idea. The Schickels, known for their strong faith and their commitment to youths as well as the larger community, embraced the plan. They saw it as an opportunity for youths to gather and meet other faith-filled teenagers from the larger Catholic community, which dovetailed with the deanery’s vision of quarterly youth Masses. Initially, the focus was limited to teens and youth ministers, then grew to include siblings, families and friends. Spurred by their faith, and in keeping with their commitment to community, the Schickels open their farm year after year as a labor of love. This attitude of service is as much a family tradition as the Mass at the Schickel farm. The couple’s son, Robert, and their grandson, Matt Schickel, took over the hayride duties this year, driving a John Deere tractor, and grandsons Michael and Patrick Hardy, both of Louisville, Ky., directed the parking. The inaugural deanery Mass at the Schickel Farm drew about 50 participants. Essentially unchanged through the years, the evening begins with Mass. Chili, hot dogs and desserts follow, along with hayrides, basketball and fellowship. What has changed is the level of involvement by the youths. Robert Schickel, a lifelong catechist, remembers the early years when the event was planned and executed by adults. He echoed his parents’ sentiments in talking about the meaning the annual liturgy at the family farm holds in his heart. Leah Cissell, coordinator of programming for the New Albany Deanery, noted that of the quarterly youth Mass opportunities supported and promoted by the deanery, the liturgy at the Schickel farm is the only one to retain its location and character over the years. Leigh Ann Campbell echoed these sentiments. The anniversary of the deanery youth Mass at the Schickel farm ended with the launch of the miniature hot air balloons, and a spectacular fireworks display.